An Oklahoma company uses 3D scanning to increase value and flexibility for its clients. Trimble technologies provide virtual “on-site” view of complex situations. When erosion damaged storm water control structures in an Oklahoma City neighborhood, engineers needed information on the conditions and materials in the affected area. Traditional point-based surveying would be slow and require field crews to work in hazardous conditions. By using 3D scanning and surveying workflows, crews produced information faster and with greater detail than could be achieved using total stations or GNSS. The washout contained a variety of natural and manmade materials. Scanning helped engineers develop solutions to repair and prevent future erosion. The problems arose with culverts and channels in the Thornberry Place subdivision. The city government contacted Smith Roberts Baldischwiler, LLC (SRB), a consulting firm in Oklahoma City, to provide surveying and engineering services. In one location, much of the erosion control below a bridge was washed out and flowing water had eroded beneath bridge support structures and the channel’s concrete pavers. The erosion had exposed underground utilities and threatened further damage. In order to develop repairs and mitigation, engineers requested a detailed survey of the area. Point cloud of the damaged drainage at the bridge. The Trimble SX10 removed the need for surveyors to walk in the hazardous area. Denniston knew from experience that 3D scanning would be the best approach. SRB had used scanning on previous projects but had not owned a scanner until it purchased a Trimble SX10 Scanning Total Station in April 2018. By combining scanning with a familiar survey workflow, the SX10 enabled SRB crews to quickly master the scanning processes. The fieldwork moved smoothly, and the crew needed only half a day to survey the site. The crew collected individual points to define essential linework, terrain features, and then used scanning to capture the entire site. Denniston said using traditional methods would have taken two full days and gathered far less detail. 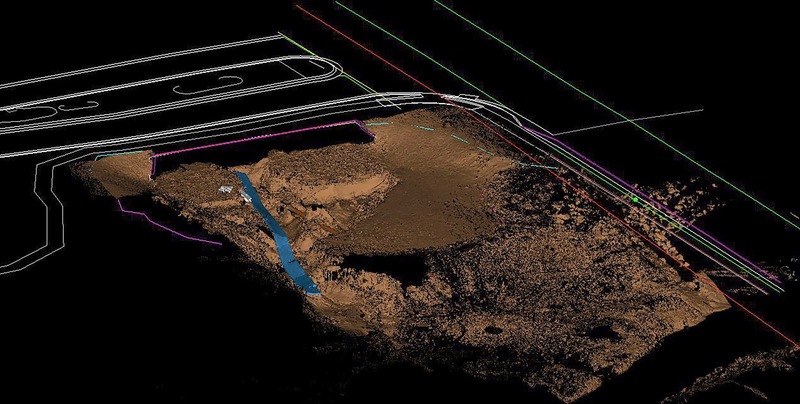 Processing the data in Trimble Business Center software, SRB technicians combined the point cloud with individual points measured by the SX10 to produce a 3D image of the site. To classify areas of different materials, they used the RGB data from the scanner to distinguish between earth, blocks and debris. Close up of point cloud showing exposed utility pipes and displaced concrete paving. The colors depict differences in elevations. SRB continues to gain benefits from the SX10. Denniston stated that it cuts field time by one-third compared to traditional techniques and has streamlined office processing as well. “We no longer need to shut down a crew so they can sit with a draftsman to make sure a drawing is correct,” he said. The comprehensive data enables CAD technicians to understand complex sites, and revisits to collect missing data are now few and far between. Colorized point cloud shows exposed utility pipe and flowing water (blue). The colors enabled engineers to distinguish between natural and man-made materials.